This week, students at Gustavus Adolphus College, a private institution in Minnesota, tore down posters calling on Americans to do their “civic duty” and report “any and all illegal aliens” to immigration officials because they are “criminals” in a “white country.” The posters, it turns out, were intended to raise awareness of and criticize anti-immigrant rhetoric — not to perpetuate it. The student organization responsible for the signs also posted disclaimers explaining their purpose. At approximately 10 a.m. this morning, the Diversity Leadership Council (DLC), a student-run organization that represents 21 student groups on campus, posted signs in Beck and Olin Hall which attacked “Illegal Aliens” by suggesting that “they are criminals.” These posts were quickly torn down and shared with members of the campus community via the Facebook Group, Overheard at Gustavus. It is the mission of the Diversity Leadership Council to formulate a collective voice when our organization recognizes the need to promote, preserve, and protect on-campus diversity. Thus, a subcommittee of the DLC, in collaboration with social justice theatre troupe I Am We Are, posted these signs and accompanying A-frames with bystander intervention tips in academic buildings on campus in an effort to help educate our peers and campus community about issues of bias, and the importance of being an active bystander. We want to help put an end to bias-related incidents that happen on our campus, social media, and in our communities by forcing individuals to have dialogues about forms of hate and Bias. In short, the DLC sought to spark students to respond to incidents of perceived bias by speaking out — that is, by being an “active bystander.” In theory, that’s a good thing: the best response to offensive speech is more speech. But that’s not exactly what happened at Gustavus Adolphus. The posters deployed by activists at Gustavus Adolphus aren’t imaginary or far-fetched; they’re duplicates of earnest posters being propagated at campuses across the country. Similar posters — which, unlike the Gustavus Adolphus posters, included the address of a white supremacist website — were recently removed by police at the University of Maryland. Others have been found at George Washington University. Drawing attention to views in order to criticize them is a time-honored tradition. Repurposing offensive or shocking imagery as a means of exposing perceived atrocities or bigotry is an important way to convey the moral urgency of one’s cause, if not demonstrate its very existence. Efforts to silence speech because it is offensive risk chilling, if not foreclosing, this critical channel of communication. 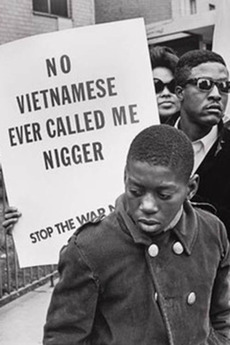 Consider protesters — and Muhammad Ali, although the exact quote attributed to him may be apocryphal — coopting racial slurs to condemn the Vietnam War, or the haunting photograph of the ‘Napalm Girl’ that crystallized the carnage of war in the minds of many Americans. Similarly, photos of Emmett Till’s body published by Jet magazine meant that the “public could no longer pretend to ignore what they couldn’t see.” Photos of a lifeless Alan Kurdi, a three-year-old refugee, have driven debate over western immigration policies. And in the United States, anti-abortion advocates often use photos of fetuses to draw attention to their efforts. Artists, too, often repurpose disturbing imagery and words. Billie Holiday’s performance of Strange Fruit, a poem written by Abel Meeropol after seeing a photograph of a lynching, depicts “strange fruit hanging from the poplar trees” in the American South. More recently, a New York student sought “to expose white privilege” through an art installation juxtaposing “WHITE ONLY” signs alongside bathrooms. 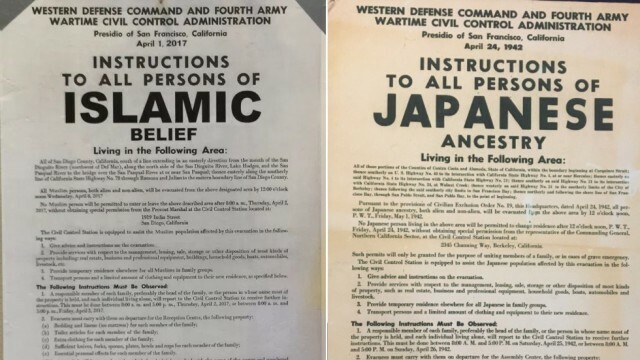 Others borrow historical records — for example, posters at the University of California, San Diego mimicking Japanese internment notices as a means to “shock and anger people” over efforts to limit Muslim immigration — to compare historical events with current events. Yet these efforts often result in some form of censorship, whether by those who misinterpret the speech to be an endorsement of the message it is intended to criticize, or by administrators who understand its intent, but simply want to avoid controversy. 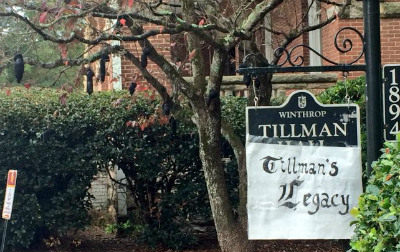 At Winthrop University, for example, a student faced disciplinary charges over an art installation depicting lynchings to pressure the university to rename a campus building named for Gov. Ben Tillman, whose term saw an increase in the number of lynchings. Then there’s Gainesville State College’s removal of a professor’s painting, which utilized a Confederate flag in order to criticize the flag’s history — censorship justified because of “the impact of an action on the health and reputation of the institution.” And at the University of Iowa, officials forced a professor to remove an art installation of a Ku Klux Klan robe made out of newspaper clippings highlighting racial violence. Banning or removing expression because it is offensive frustrates the ability of artists and activists alike to use offensive or shocking imagery as a means of demonstrating that a perceived evil exists, or highlighting its effects in order to make a more compelling, visceral argument. Removing offensive speech — whether at the hands of administrators or an aggrieved audience — often risks inadvertently censoring those the actor intends to protect. The two posters were ripped down by students about five minutes after they were posted, but it was many hours before students were told who was behind the signs. “It was very poor execution. I have friends of color who [were] very afraid,” James Pixley, a sophomore, told Fox 9. JoNes VanHecke, the Dean of Students, told Fox 9 the school was aware of the plan to post the signs, and had staffers supervising the posters. “We had multiple students who reported the incidents to the institution and that’s the kind of positive bystander interaction we would hope for,” said [Dean of Students JoNes] VanHecke. That’s not cause for celebration. Yet — approaching irony — administrators are pleased that students tore down and reported, to administrators, posters calling on students to report fellow students to the government. That’s not a constructive form of “more speech” in response to offensive speech. The Gustavus Adolphus community is free to criticize the posters and question the wisdom of their deployment. Using Facebook to share the posters in order to criticize them — just as the people who put up the posters sought to do in the first place — was a better, “more speech” response.